Deborah Lippmann’s Autumn / Fall shades have been slated for a September UK launch with sadly no word yet on whether we’ll be seeing the glorious glitters that make up the Nordstrom Anniversary set (unless, they’re re-released in a different format, I very much doubt it). But anyway, wipe away the tears and check out these infinitely more sensible shades instead. I can’t say that any of them are really shouting my name… Billionaire looks interesting but I just wanna chuck some sparkle in there. Brick House has the potential to be better on the nail than in the promo and Stormy Weather just does nothing for me I’m afraid. 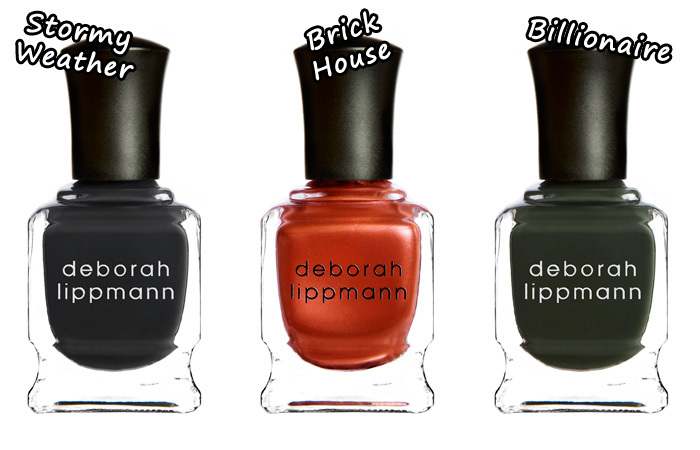 The Deborah Lippmann Autumn shades are set to launch in the UK exclusively at House of Fraser on the 19th September priced at £14 each. Nah, not remotely appealing. Give me the glitters! Hrmph. Stormy Weather looks similar to NARS Galion, veeery similar indeed. I think Billionaire is a winner though, although maybe that’s just my love of darker polishes for you – cannot wait for Autumn, although personally I do feel a wine colour would have been more appropriate than that ghastly orange. There is a wine color in this collection called Single Ladies. I really like Stormy Weather – I can totally see wearing that for the fall. I also very much like Billionaire. It’s a nice dark green that isn’t too green (if you know what I mean). I’m afraid Brick House does nothing for me – it’s a little orange. I don’t mind no glitter (in fact I prefer it) but I’m pretty sure I could find very similar colors for much less $$$ – I guess it’s just not impressive enough to purchase! I love dark cremes, so Stormy Weather and Billionaire look goooood to me! The only that appealed to me about DL are their glitters. Brick House seems slightly interesting though I guess?.. Lovely! I’ve been wanting to try Deborah Lippmann forever! Sort of intrigued by Brick House. Always like a burnished orange but then fear I’ll end up looking like the sophisticated Tess in Working Girl. Will have to try it out to see.